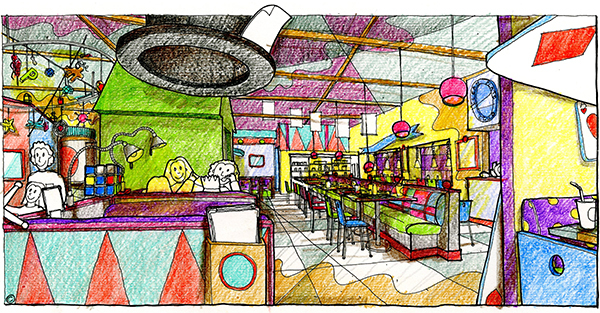 Peanut Butter Grille is a prototypical concept developed for an established restaurateur, who saw a need to provide healthy sustenance for family dining. 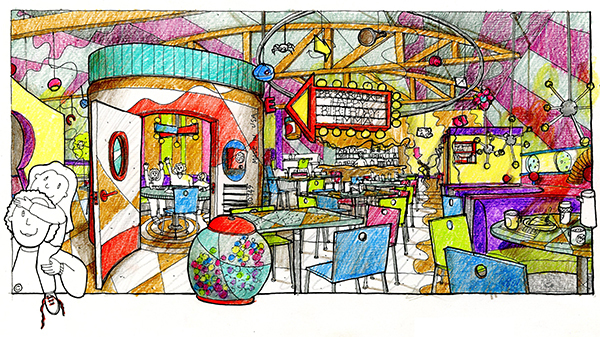 The deliberately entertaining concept focuses on the child as the guest, who happens to bring mom and dad along to the irresistible world on the Peanut Butter Grille. From the creamy color entry, a PBG host and her fantastic cart cheerily greet children and caregivers. There’s never a “wait” at PBG. Instead, you explore the Big Crunchy, an overturned enormous jar of peanut butter filled with lots of things to do, from magnet walls to kitchen art-making. Or discover the wall of pinball machines that keep gamers happily entertained. The Peanut Gallery is a place to really make a mess, draw on all the walls or pound some pizza dough. When your table is ready, there are an almost endless variety of tables, jars, and counters, and funky seats for dining. There are booths with old-fashioned telephones in them. There are high backed chairs with peek-a-boo holes. There are lots of food options including good-for-you meal that surprise mom and dad with their nutritional value. The restaurant provides Goldilocks and the Three Bears-inspired sized meals, too, perfect when feeding tots, teens or hungry parents. Part of the PBG design creates spaces for a club, a PBG.com zone for club parents to log on to order take-out or check E-mail, and a stage with storytelling nook for programmed activities, school groups, and tours. In the mornings, the Roast Coffee Club is a place with extra large booths where caregivers, nannies, moms, or dads can come with little peanuts (your infant or toddler) to lounge, relax or sip a latté while your child is engaged in the secure padded crawling zone. Programmed zones include a junior kitchen where cooking classes for kids and/or parents, birthday parties, and chef chat, conversations with the chef about farm fresh food and healthy dining and cooking choices for the entire family take place on a regularly scheduled basis. Architecture: Architecture Is Fun, Inc.
Renderings: © Architecture Is Fun, Inc.